Nashville, also known as Music City, is gaining a reputation as a foodie destination. 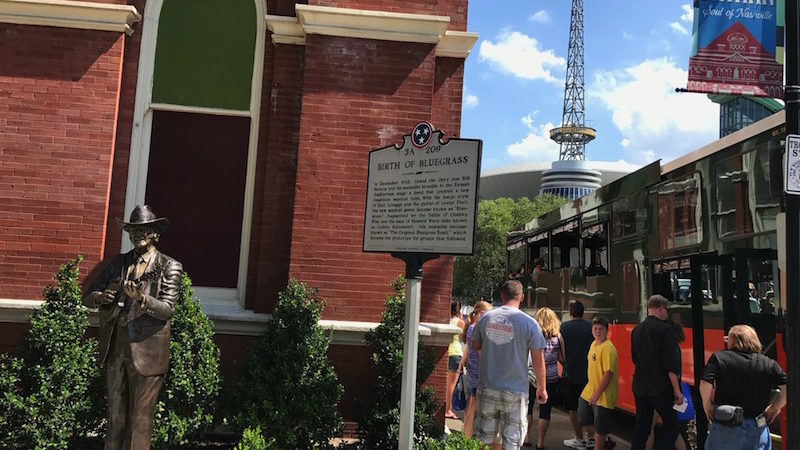 Vegetarian TravelingMom found she saved her money to spend on food by taking advantage of the many free things to do in Nashville. If you love live music, head to Nashville, Tennessee. Music City is known for its music venues, and for its burgeoning food scene. [And that includes vegetarian options.] What may be lesser known is that the city is also great for bargain hunters. 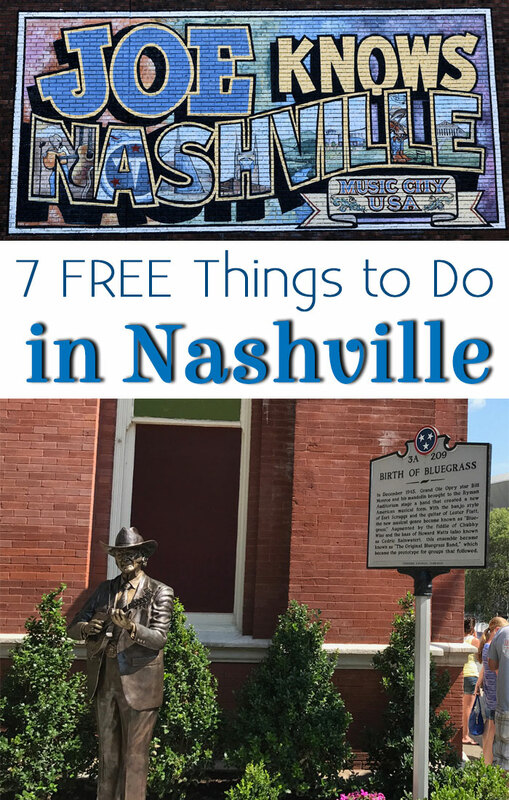 Here are 7 free things to do in Nashville. The subterranean Tennessee State Museum has interactive exhibits about Tennessee history, along with a rotating art gallery. 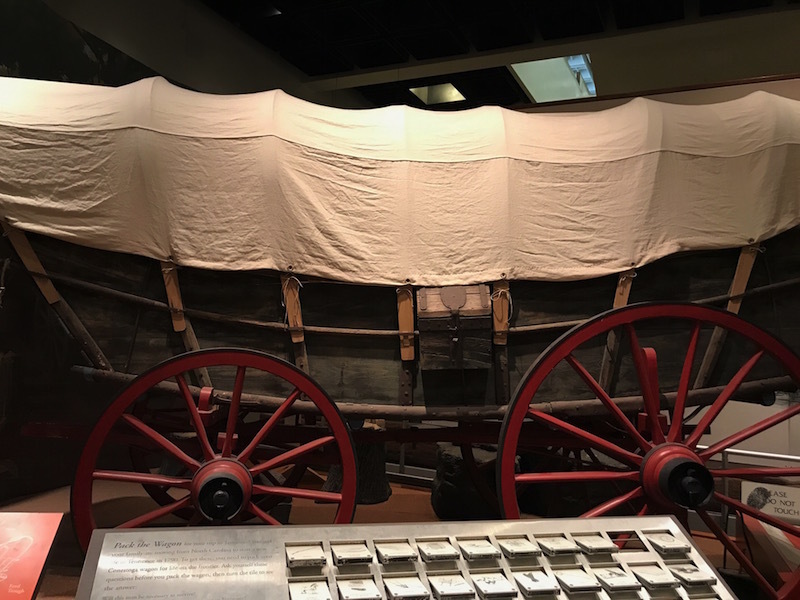 The comprehensive museum goes from prehistoric times through the frontier, Civil War, and Reconstruction to The New South. 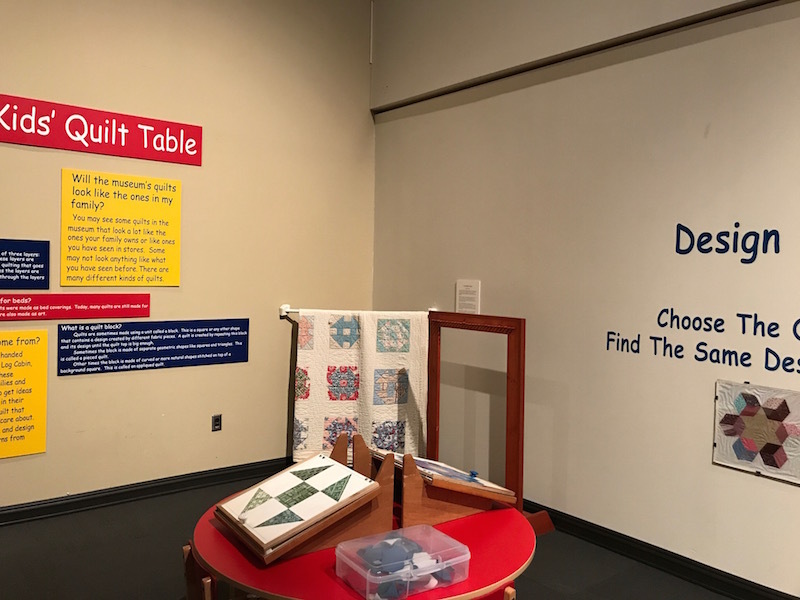 Three floors of exhibits include a pioneer log cabin, with supplies so kids can build their own, and examples of different artifacts made by local silversmiths. Kids can also try their hand at quilting. The museum does not gloss over some of Tennessee’s less wholesome past, with several galleries devoted to slavery. There is also a pillory where horse thieves were whipped and had their ears lopped off. The museum is open Tuesday through Saturday. Note that there is no cafe in the museum, but there is a small gift shop. The 21C Museum chain has free rotating exhibits at all its hotels. The new downtown Nashville location has 10,000 square feet of gallery space in the lobby and on the lower level. Since it’s a hotel, the gallery is open daily. 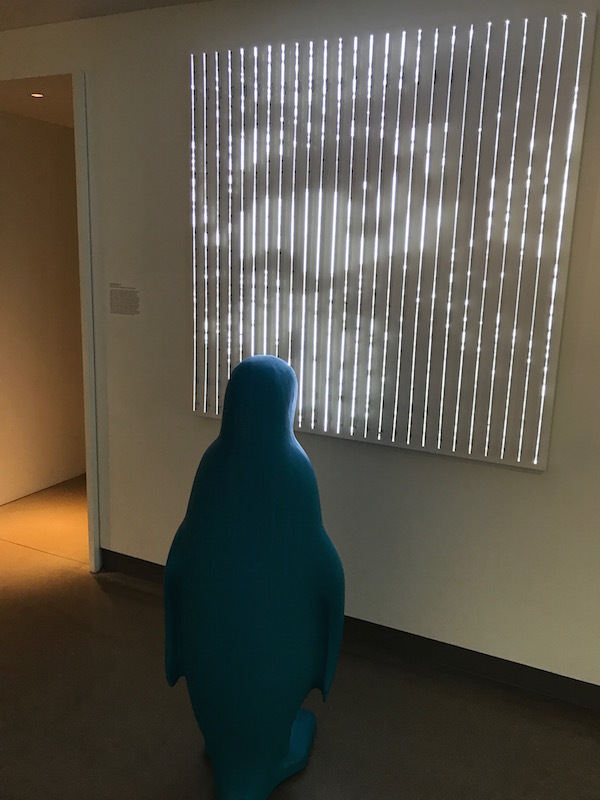 The distinct turquoise penguins are also scattered around the lobby. Nashville can get quite hot in summer, and it averages over one hundred rainy days a year. Bring an umbrella and appropriate warm weather clothing. But you can escape the heat and rain by hopping on a bus. In downtown Nashville, the public buses travel two free routes. The Green Circuit goes between the Gulch and the Bicentennial Mall area. The Blue Circuit travels between the Riverfront Station and the Bicentennial Mall area. Broadway is lined with bars that offer live music. In warm weather, the doors and windows are thrown open and you can stop outside and hear a song or two at every spot, for free. Musicians also play on the street, so you can hear even more music outside. At Savannah Candy Kitchen, also on Broadway, you can get a sample of the signature pralines. You can also watch the candy being made. To see more candy being made, head around the corner to the Goo Goo Shop and Dessert Bar. 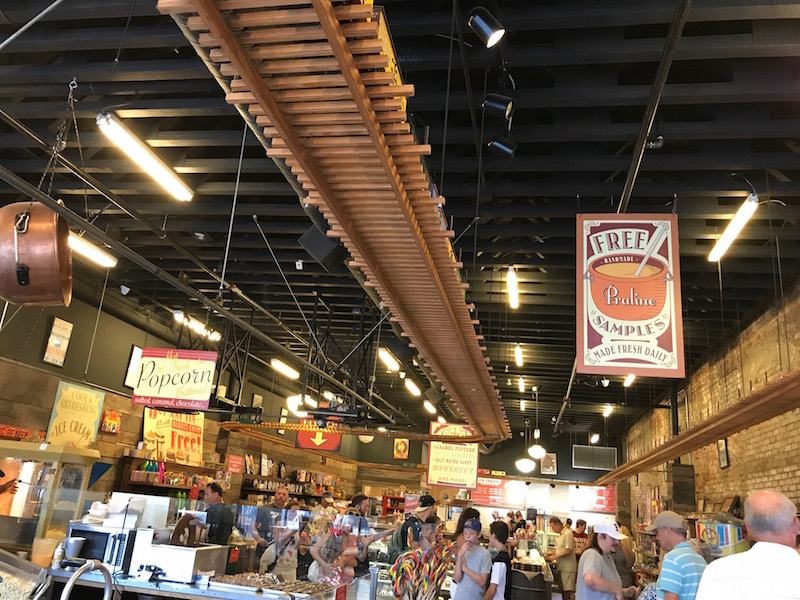 Sadly, there are no free samples of Goo Goo Clusters here, but you can watch this iconic Nashville treat being made, and see artifacts from the company. You have to pay to enter the Parthenon, the only full-size replica of the Parthenon from Athens, Greece. But you can see the building from the outside, and enjoy the rest of Centennial Park, for free. [Also, if you go to see the Parthenon on Monday, as I did, you can’t go; it is closed]. 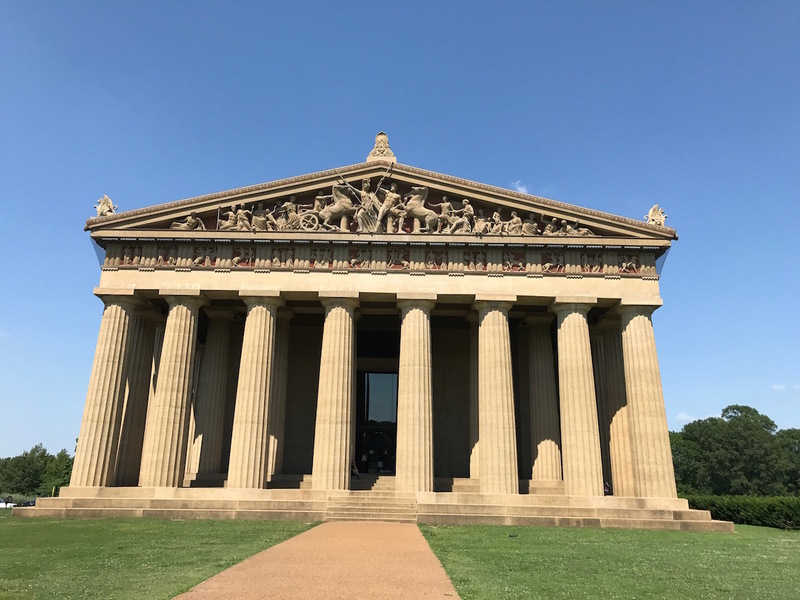 Explore the Parthenon, built for Tennessee’s 1897 Centennial Exposition. The park has a large playground, a walking trail and , n exercise trail. It also has a unique art project, “If Trees Could Sing.” You enter the QR codes on the 18 trees and hear stories and music about trees. Don’t confuse this downtown park with Centennial Park, two miles away. Bicentennial Park offers free one hour tours, led by park rangers, Monday through Friday at 2 pm. 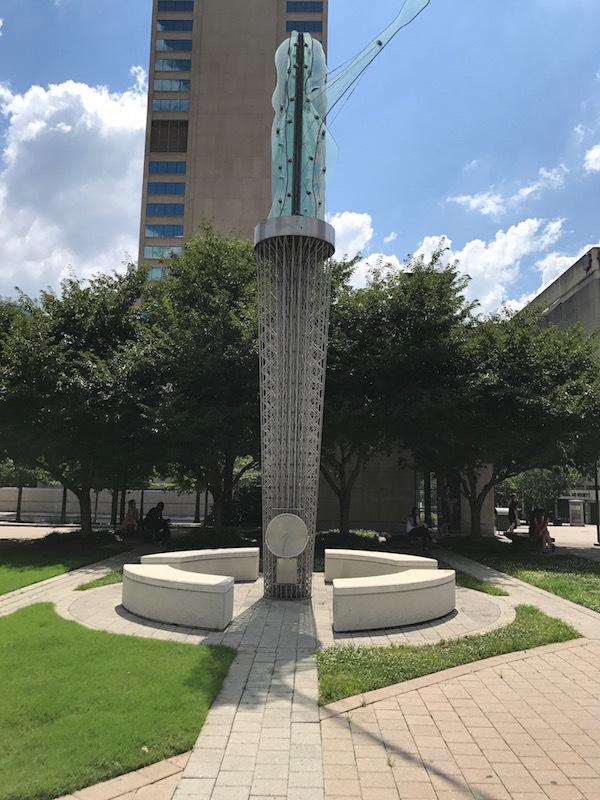 The park has a World War 11 Memorial, 31 fountains representing the major bodies of water in Tennessee, and native trees, shrubs, ferns, grasses, and wildflowers. There is a Military Museum and the State Capitol, both closed on Sundays. Which was the day I had to tour Nashville. So I have to return. The State Capitol offers guided tours Monday through Friday. The Military Museum is open Tuesday through Saturday. Note: I was in Nashville to test drive the new Infiniti Q50. Infiniti paid for my travel expenses; everything else was free. Opinions, of course, are my own.